Is Sustainable Development of Deserts Feasible? Hot deserts cover about one-fifth of the Earth's land area (1). They are usually characterized by the lack of moisture and the abundance of sunlight. Both factors generally make hot deserts unsuitable for living. One of the key global environmental problems is the rapid expansion of deserts into arable lands. According to UN estimates, one-third of the Earth's land area is at risk of turning into desert wasteland (2). By 2025, two-thirds of the arable land in Africa is expected to disappear, along with about one-third in Asia and one-fifth in South America. Over 30% of the land in the United States is affected by desertification. Over 250 million people are threatened by desertification, and more than half of them are at risk of being displaced to other parts of the world. The major desertification causes are overcultivation, overgrazing, deforestation, poor irrigation practices, sloppy conservation, overtaxed water supplies, and soaring population. The continent most affected by desertification is Africa with its Sahara desert, which is the largest hot desert in the world. To fight desertification, provide food, water, and other humanitarian aid, and reduce poverty in Africa, UN yearly spends billions of dollars. On the other hand, desert is now considered as a potential solution to energy crisis, another key global problem today. Every year, each square kilometer of hot desert receives a solar energy equivalent to 1.5 million barrels of oil, and about 57 million TWh of solar energy falls down on all hot deserts of our planet (3). In contrast, the worldwide energy consumption in 2005 was as low as 135,000 TWh (4). The Sahara alone, with an area of 9.1 million km2, receives about 20 million TWh of heat per year, which, even with the today's 10-15 % solar energy/electricity conversion efficiency, is ten times more than the overall energy consumption in the world (3). This gave a rise to a lot of projects aiming at utilizing solar energy, ranging from photovoltaic batteries to power plants with sunlight concentrators. 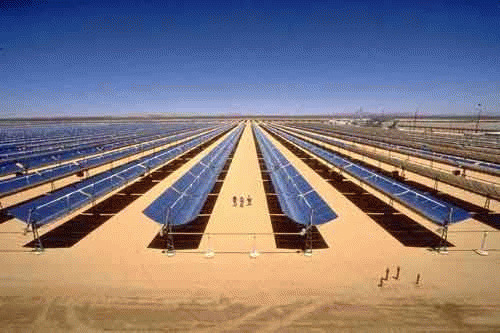 However, the direct implementation of these sun-powered technologies as separate processes is strongly hindered by the high expenses caused by the transportation of produced power, negative environmental impact on desert wildlife, and the absence of highly efficient power storage technologies, which are needed to supply power when the Sun is not shining. It should be noted that the implementation of these technologies alone is nearsighted because this solution cannot slow down desertification, bring deserts back to the stock of arable lands, and contribute to solving the problems of the growing deficit of water and food. At the same time, desert is a system similar to the extremal habitats studied by space life support science since the mid 1950s, which are characterized by the availability of a powerful source of thermal energy and nearly complete absence of organic life and water (5, 6). Our analysis of numerous long-duration manned experiments in ground-based, closed-loop testing facilities, imitating the conditions of Moon and Martian missions  3-month to one-year Russian experiments at the Institutes of Biomedical Problems (Moscow) and Biophysics (Krasnoyarsk), 3-month experiment at Johnson Space Center, "amateur" Biosphere 2 in Oracle, AZ (7), and the like  leads to a conclusion that the life in such habitats cannot be efficiently maintained by physicochemical life support systems for long time, even with unlimited supply of solar energy. The basic design principles for physicochemical systems, which include the highest productivity, least footprint, and production of desired components at the expense of waste generation, contradict the nature's principles. 2. The efficiency of the system can be increased by consuming the wastes (carbon dioxide, nitrogen compounds, and other nutrients and catalytic substances) produced by the units not involved in the regenerative processes. 3. The consumption of solar energy should be diversified: electric power by photovoltaics and power plants with sunlight concentrators, thermal power for photosynthesis, heat accumulators for dark periods, accompanied by the use of different power sources, such as hydrogen-oxygen fuel cells and the like. 4. Feedstocks and processes for biofuel production should be diversified: starch, cellulose, lignocellulosic biomass, fermentation, biorefinery, etc. 5. The processes to be integrated into the system should be able to use its wastes and/or products as feedstocks, with all the wastes, including the wastes of these processes, being completely processed by the system. 6. The rate of waste formation should not exceed the system's capacity of processing the waste. 7. The system should provide complete water recycling by collecting all the evaporated plant transpiration and soil moisture and the water contained in the gathered crop. The water vapors and collected water should be treated by methods as close to the natural treatment processes (electrostatic ionization, soil infiltration and percolation) as possible to provide its biological activity. 8. Foreign substances that can poison or slow down the regenerative processes are strictly prohibited. 9. All subsystems and units should be as close to each other as possible to reduce the transportation expenses and losses. 10. The system should be carefully monitored and controlled to achieve the highest efficiency. Generally speaking, the above implies that the design of such systems should be based on a systems approach and closely mimic the basic nature's principles.